The NOAA Planet Stewards Education Project strives to provide knowledge and resources to educators who are working with elementary through college-aged students. That information can then be used to shape scientifically-informed individuals and communities who are prepared to respond to environmental challenges monitored by NOAA. The workshops allow educators to engage with scientists, education and communication specialists about environmental challenges impacting different regions and to discover resources and activities that they can bring back to their classrooms or communities. The Texas workshop highlighted environmental impacts to the U.S. Gulf Coast. 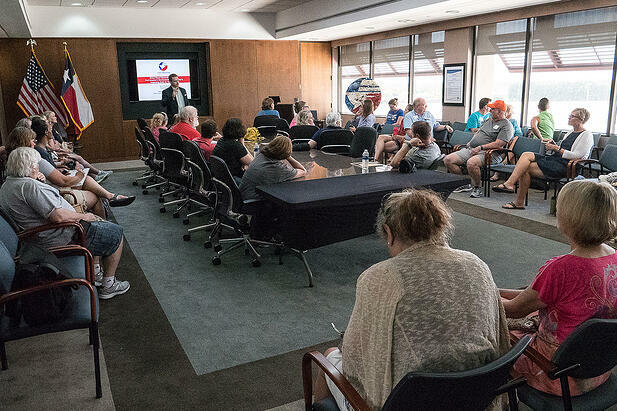 Port Houston hosted the educators on the last day of the four-day workshop. Port Houston’s staff from Infrastructure and People divisions presented on environmental stewardship efforts and conducted a classroom exercise on assessing the technical and financial case for installing solar photovoltaic panels on a rooftop. The visitors also took a tour aboard the M/V Sam Houston. Port Houston is an environmental leader, internationally recognized among top-ranked ports.